With the recent adoption of the UN Global Compact on Migration (GCM), and the integration of migrants’ rights into the Sustainable Development Goals 2030, the issue of the protection of migrants’ rights in international human rights law has never been more topical. But how is the issue of immigration detention addressed by these frameworks? 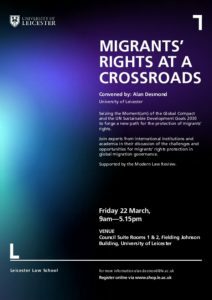 On 22 March, GDP researchers Mariette Grange and Izabella Majcher attended a University of Leicester conference – “Migrants’ Rights at a Crossroads: Seizing the Moment(um) of the UN Global Compact on Migration and the SDGs 2030 to Forge a New Path for the Protection of Migrants’ Rights” – to examine this question. Their presentation, “Immigration Detention as a Challenge to Realisation of the Global Compact’s Objectives and Goals of Agenda 2030,” shed light on issues of immigration detention within these two processes and reaffirmed the continuing validity of the international legal framework governing immigration detention in a context where contemporary global manifestos such as the Agenda 2030 and the GCM are not legally-binding.